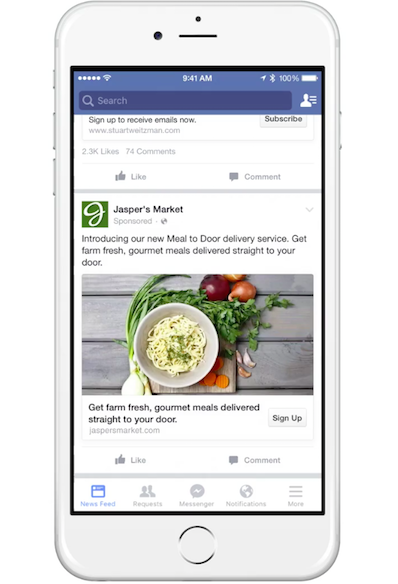 Today, we’re excited to announce the beta launch of a new Segment Source: Facebook Lead Ads. With Facebook, people provide their information to their selected business via a pre-loaded form within Facebook. Lead Ads have been shown to be effective across verticals, with popular use cases in generating newsletter sign ups, event attendees, and seeding product discounts. As we all know, collecting leads for your business is only half the battle. If you hope to turn your leads into customers, you have to activate them quickly. Whether this means sending them an email, calling them, or creating an account in Salesforce for outreach, these follow-up actions happen outside of Facebook. Most often, connecting this data involves a never-ending CSV export-import loop, which can be tedious and error-prone. The Segment integration with Facebook makes this process seamless. Starting today, you can use Facebook Lead Ads to capture rich, first-party data from prospects, and use Segment to send it into your marketing tools in real time. By cutting down the amount of time it takes to get this information into your marketing tools, you can reach your leads with the right marketing campaigns immediately and increase their chance of conversion. Research from MIT shows that allowing an hour to pass between when a lead is generated and when the next step is taken can decrease the value of that lead by 13x. A prospect has expressed interest in learning more about your product, but attention spans are short. Reaching out to them while you’re still top of mind is imperative. This month, our marketing team used Facebook Lead Ads for the first time to promote a webinar. In the absence of the Segment integration, we downloaded our leads and uploaded them into Customer.io and Salesforce for outreach. On average, 24 hours passed before they received any outreach from us. Using the Facebook Lead Ads integration, we were able to email customers less than 30 seconds after they submitted their information. Every company has its preferred method of contacting new leads, and some methods are more effective than others. Maybe you prefer to send out a mass email. Maybe your sales team reaches out to leads individually. Or, at least, make it appear as if they do. Segment integrates with hundreds of tools. No matter how you contact your leads, you’ll be able to reach them quickly. Getting set up with the Segment’s Lead Ads source typically takes between 5-10 min! Log into your Segment account, add Facebook Lead Ads as a new Source, and select the downstream tools you’d like to send your leads to. For full details of the integrations you can use with Facebook Leads Ads, see our documentation. The Facebook Lead Ads Source (beta) is available now in your Segment dashboard. Log in to Segment, activate, and start working your leads today. Want to learn more? Watch our joint webinar with Facebook to find out how to improve your Facebook Lead Ads with Segment.